How much more powerful is a magnitude 7 earthquake than a magnitude 3? Most maps give the wrong impression. It sounds like it should be twice as strong, but it's not. Actually, a quake of magnitude 8 releases a million times more energy than a magnitude 4 quake. That's because the earthquake scale—called the Moment Magnitude Scale, which replaced the Richter Scale—is logarithmic, rather than arithmetic. If you don't remember logarithms from school, each number on a logarithmic scale represents a factor of ten, so a magnitude 8 earthquake shows up on a quake-measuring seismometer as ten times larger than a magnitude 7. And it releases more than 30 times as much energy. This isn’t an unusual way of measuring forces, but it can be hard to understand the differences between the numbers, in part because visualizations of earthquakes don’t always take the logarithmic scale into account. 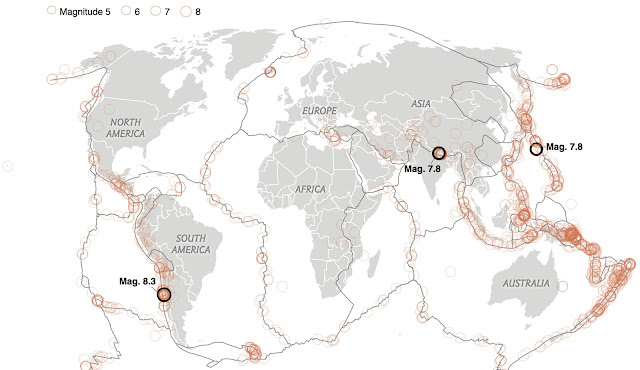 Even the United States Geological Survey (USGS) uses arithmetic dots when showing where quakes strike. Here's a look at how one year of earthquakes (October 1, 2014 to September 30, 2015) looks with an arithmetic scale and a logarithmic scale. Here's how we can compare arithmetic and logarithmic scales. That means the magnitude 9 Tōhoku earthquake, which caused the 2011 tsunami in Japan, released 11 times more energy than the biggest earthquake of this year—an 8.3 in Chile—and 1,000 times more than the 7.0 that hit Haiti in 2010.